Michael Alexander Willens is leading an excellent historically informed performance (HIP) cycle of Mozart's piano concerti, of which we have already noted two volumes. At the center of its success is the soloist, Ronald Brautigam, a Dutch fortepiano specialist who has released top-notch complete sonata cycles for Mozart and Beethoven. In the concertos Brautigam is playing on a reconstruction of a historically appropriate fortepiano by the American-born instrument builder Paul McNulty. In the latest installment, he adds two more concertos, K. 449 and K. 467, composed within about a year of each other. 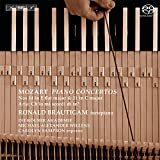 Brautigam plays Mozart's cadenzas in the former and devises his own for the latter, the latest in a long line of candidates aiming to replace those by Mozart, now lost, including Alfred Schnittke and Philip Glass. This disc includes a lovely lagniappe, the concert aria Ch'io mi scordi di te?, K. 505, composed for the Vienna farewell concert of Nancy Storace, the English soprano who created the role of Susanna in Le Nozze di Figaro, in 1787. The orchestration for two clarinets, two bassoons, two horns, and strings is augmented by a part for solo keyboard, apparently intended for and played by Mozart at the premiere, making it indeed like a mini-piano concerto of sorts. The text, possibly by Lorenzo da Ponte and originally made for another aria inserted into the opera Idomeneo, seems to refer playfully in its new context to the impending separation of composer and soprano. The performances are all excellent, especially the solo work of soprano Carolyn Sampson and Brautigam, but also the full-bodied horns and trumpets of Die Kölner Akademie. If my favorite Mozart concerti remain those recorded by Christopher Hogwood and the Academy of Ancient Music, with Robert Levin improvising his own cadenzas at the fortepiano (incomplete and now hard to find -- please, Decca, you need to re-release a box set), this cycle is shaping up as a close second. It's worth mentioning that Michael Willens grew up in Bethesda and attended BCC high school. Yeah, I mentioned that in one of my earlier reviews, but always good to say it again.